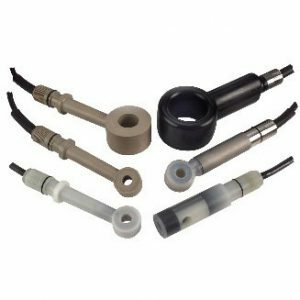 The Foxboro brand Model 871EC Electrodeless Conductivity Sensors, in conjunction with a variety of supporting sensor accessories, provide fouling-resistant measurements in all types of process liquids. Because of the electrodeless technique and innovative sensor design, years of continuous operation and meaningful indication of solution conductivity will be realized. The electrodeless conductivity sensors measure an induced current in a loop of solution. Two or three toroidally wound coils are encapsulated in close proximity within the sensor which is immersed in the solution. An ac signal, applied to one toroidal coil, induces a current in the second coil, which is directly proportional to the conductance of the solution. This current is the input to a Foxboro Model 875EC Intelligent Analyzer, a Model 870ITEC Intelligent Transmitter, a Model 870EC Analog Transmitter, or Models 873EC and 873AEC Electrochemical Analyzer, all used for electrodeless conductivity measurement.